There is growing evidence that many diseases are thought to be linked to disequilibria of the microbial communities inhabiting the human gastrointestinal tract, where mucosal membranes act as the site of much metabolic functionality and physiopathology (“ A Gut check for Many Ailments”, S.S. Wang, Wall Street Journal, January 17, 2012). Our initiative converge technologies in nanomaterials, microfluidics and molecular biology to address fundamental research and clinical questions related to human-microbial molecular interactions in mucosal interfaces, and aims to contribute to the generation of new knowledge to guide optimizing individualized diagnostics and therapeutic treatment. 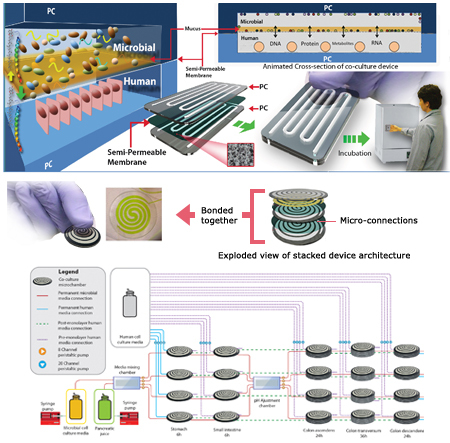 Our team has developed a 3D microfluidic-based device suitable for the close proximity co-culturing and inclusion of human cells, mucous membrane and microbiota for testing hypotheses in a closed and controllable system. Systems biology methodologies, comprising microbial community profiling, transcriptomics, metabolomics and others, coupled with physical science sensing and bioinformatics data analysis, provide the opportunity to develop a system with the ability to interpret complex and specific mechanisms of mucosal interfaces in mixed host-microbial communities modulating health. This initiative comprised several projects with collaborators at the University of Luxembourg (Prof. P. Wilmes), the Fitzpatrick Institute for Photonics at Duke University (Prof. T. Vo-Dinh), TGen North (Prof. L. Price) and the College of Medicine – Phoenix (Prof. M. Herbst-Kralovetz).